There's been a ton of investor money pouring into content-driven, virtual-reality startups like Within and Lucid in recent months. Ad-focused VR players have been largely relegated to the sidelines, watching and waiting until the space becomes more mainstream with consumers. There was a sign on Wednesday that those days could be coming to a close. Vertebrae, which is an ad-tech firm focused on virtual reality, announced a $10 million round of funding to propel its eponymous advertising platform. The Santa Monica, Calif.-based player declined naming its investors but said they were non-media companies. Vertebrae is on a bit of a roll, as its funding news comes just a week after its first ad campaign with Lionsgate marketers for The Blair Witch Project. The company's competitors include startups like Immersv, Kiosked, Omnivirt and VirtualSky, which are also attracting funding. Industry observers predict bigger things for the space as VR headsets gain more traction—as content evolves, the ads will follow, they say. "Industries have been conditioned to pay attention to what's down the road—even if it's only 1 percent of your time," remarked Adaora Udoji, managing director of The Boshia Group, a research and investment firm. "It's never too soon—that's one of the lessons of digital. You need to be in parallel with the revolution. The eyeballs are going to go there." TechCrunch reported in March that the VR/augmented reality investment scene has already reached $1 billion. To part of Udoji's point, the ad-tech players in the bunch are starting to attract brands like General Electric, LG, aforementioned Lionsgate and others by pitching an immersive experience where pre-roll blindness, ad blocking and ad fraud are non-issues. Vertebrae, in particular, boasts that its platform is "device-agnostic," meaning it can help facilitate ads for Oculus Rift, HTC Vive and other futuristic headsets. For Lionsgate, it's trying to conjure promotional magic with an edgy VR trailer that immerses fans in 90 seconds of intrigue and terror. Vertebrae also worked with Otherworld Interactive to build 360-degree mobile ads for The Blair Witch Project. "We're not just an agency that's going to build an ad experience and then put it in a single destination," said Vincent Cacace, CEO of Vertebrae. "We're building a conduit and a pipeline to give exposure across all parts of the ecosystem." KBS Ventures partner Jessica Peltz sounded fairly skeptical about the system. "Doing 360 video on mobile in place of pre-roll is a moderate improvement, but it's still a static experience where the novelty can wear off quickly," she said. 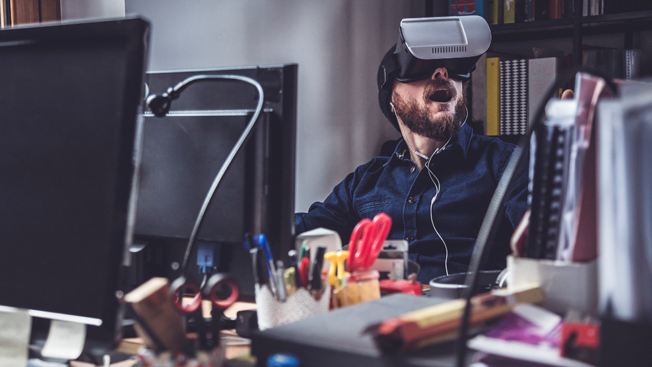 At the same time, Peltz pointed out that better measurement may be the key to moving VR advertising forward when it comes to investors and brands alike. With that in mind, Entrypoint is a 1-year-old company that focuses on VR distribution and analytics, working with creative agencies and content shops. The New York-based startup said it's currently closing its first round of funding. "We've had the warmest reception in the marketplace," said Carissa Flocken, Entrypoint CEO, "because it's clear how we can build the viewership they want to reach."